In the universe of EVE Online, players from every timezone around the globe have been waging wars on a massive scale for nearly 11 years. Some conflicts have been relatively small grudge matches between rivals from adjoining solar systems with maybe a dozen or so frigates and cruisers facing off in fast-paced combat. Others, like the Great War, are fueled by tens of thousands of players and blossom with all the same propaganda, diplomacy (and espionage), supply-chain logistics and military tactics that might fuel a real-world conflict, taking months to resolve and changing entire industrial patterns across the star map. In all that time one kind of ship has always been the most coveted target for any fleet, thirsted after for the glory of defeating it as evidenced by this recording of the first one to die in combat. Titans, the largest ship class in EVE Online, take thousands of man hours to produce, take months to train to fly, and are capable of fitting massive doomsday weapons that obliterate lesser ships with a single volley. To get a good understanding of the size of these Sci Fi monsters, check out this comparison chart (the Amarr Avatar is the brownish “mushroom” looking behemoth with the similarly sized Erebus above it and Ragnarok and Leviathan below it. Other EVE ships are found throughout) or watch this to-scale player-made video comparing several classes of EVE ships. 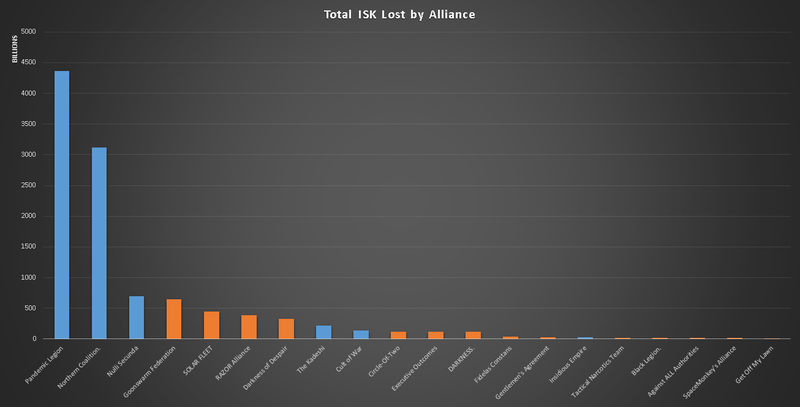 Each Titan is a prized strategic asset of the Alliance that controls it, and up until now no more than 12 had ever been destroyed in any single battle. That recently changed in the largest, most destructive battle in gaming history. In the early hours of January 27th, 2014 CONCORD (the NPC “police force”) came to collect the sovereignty bill for a dead-end system in the Immensea region called B-R5RB. One of over 7,500 in game, this particular system – with its 9 planets, 66 moons and 12 asteroid belts – had recently been transferred to a player corporation called H A V O C, a corp used by the alliance Pandemic Legion to handle sovereignty transfers between Alliances (which are collections of Corporations). Unfortunately, when CONCORD tried to extract the ISK (EVE’s currency) that would maintain sovereignty in the system for another month, they found that H A V O C had left their automatic payment unchecked. Without the necessary payment, sovereignty in the system immediately dropped leaving the system up for grabs. 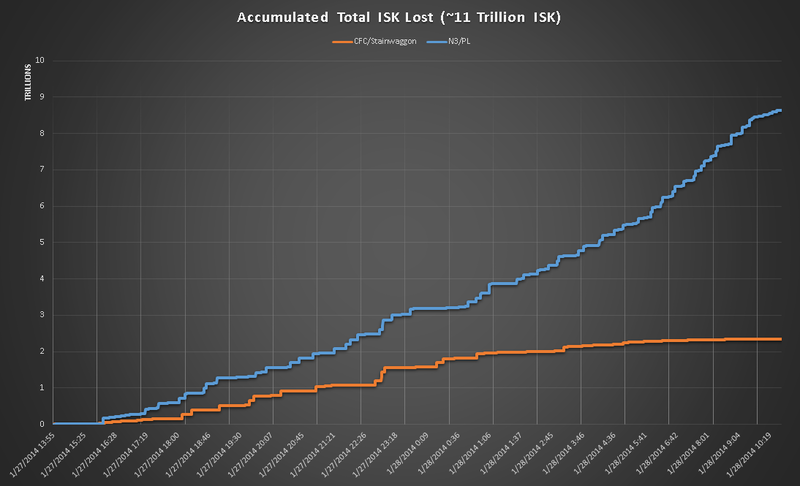 Missed bill payments are certainly not new to the human experience nor are they to EVE Online. Human error has caused many a system to lapse. Sometimes it merely means that another Territorial Control Unit (a flag of sorts) has to be anchored in space to regain control of the system. Sometimes it means that an entire region is lost and an Alliance is disbanded. 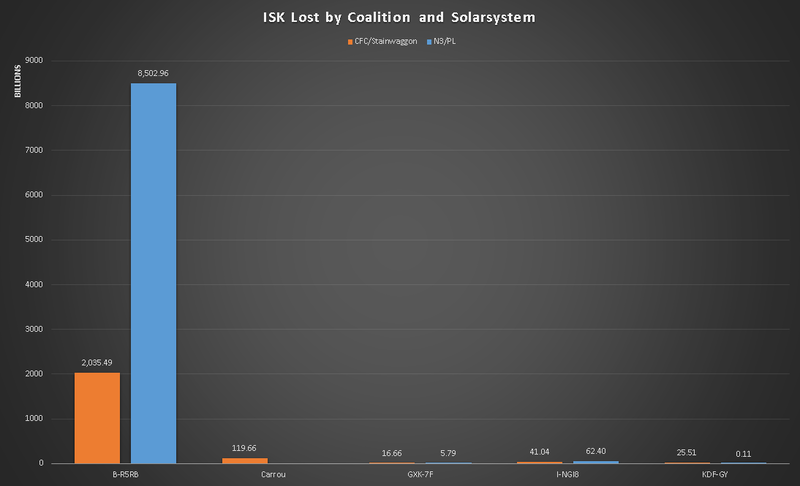 This particular system however happened to be the staging system for all Pandemic Legion fleets in one of the largest wars to ever be waged in EVE Online. 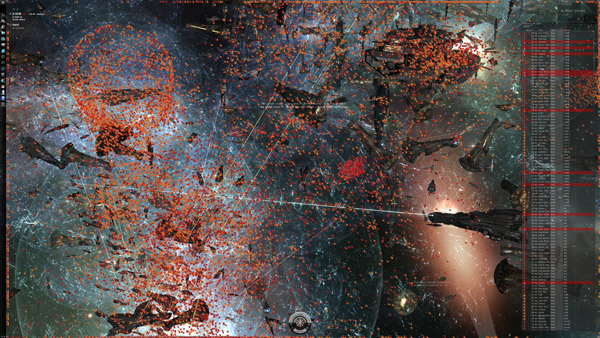 The Halloween War, having waged for months, had been punctuated by many engagements across the vast EVE universe. 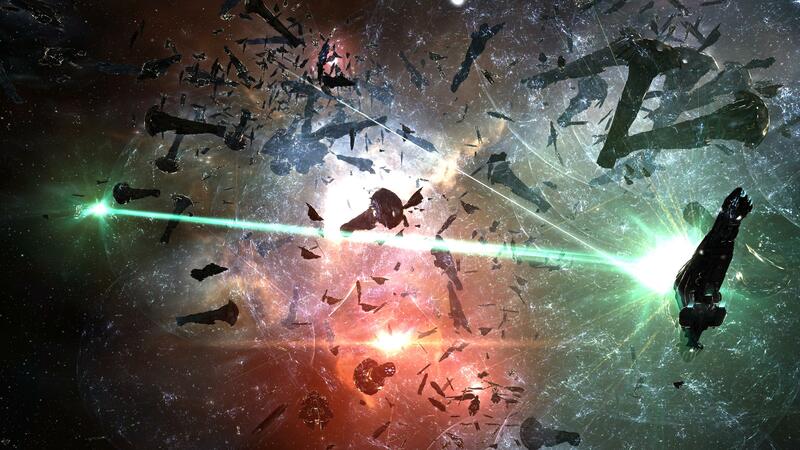 This single missed payment sparked off what would become the most expensive battle in EVE Online history. One pilot’s action (or inaction) had repercussions for the entire universe—a butterfly wing causing a massive typhoon of destruction. Coincidentally, this occurred a year to the day of another infamous battle where a single mistake by a single player offered destruction on a galactic scale—the Battle of Asakai. Sensing this moment of unexpected weakness in a strategically critical location, the opposing Coalition comprised of the CFC Alliance and Russian-heavy coalition forces scrambled to get a foothold in the system. The message went out. Thousands logged in and fleeted up. If the CFC and Russian fleets could capture the station in system, they would trap Pandemic Legion assets inside, including hundreds of capital and sub-capital fleet hulls, rendering them unavailable for the wider conflict. Meanwhile the forces of Pandemic Legion and N3 (a coalition made up Nulli Secunda, Northern Coalition. and assorted other allies) tried whatever they could to maintain control of the system. Despite anchoring Territorial Control Units all over the system, opposing forces destroyed them before any of them could online to regain control. In an attempt to at least secure the station, Pandemic Legion and N3 deployed what capital and super-capital forces they could muster in their patented “Wrecking Ball” formation just off the station. 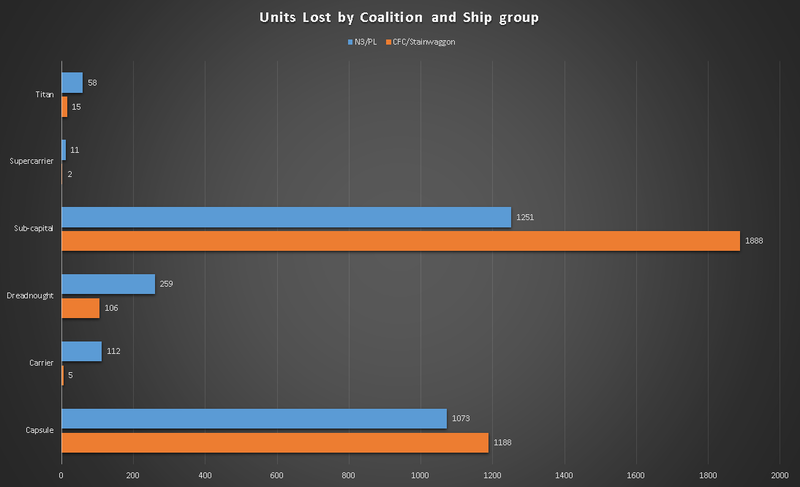 Upon seeing that Pandemic Legion and N3 had a smaller capital and super-capital fleet (due to the surprise nature of the fight and it occurring during a Monday work day) CFC and Russian forces decided that it was time to seize the opportunity for a decisive fight. Taking into account lessons learned in the massive “Battle of HED-GP” earlier in the week, which had been a resounding loss for the CFC and Russian Forces at the hands of the “Wrecking Ball,” they chose this time to seize the initiative and deploy the entirety of the Capital Fleet to gain field superiority before PL and N3 could respond. Meanwhile, their sub-capital fleets were deployed to N3 staging systems to delay any reinforcements. Unlike nearly every other large scale super-capital engagement up till this point, both sides thought they could win. They continued trying to get every single pilot into system with the most powerful warships they could bring to bear. After a few hours, the field was being lit up by doomsdays and the glittering hulls of hundreds of Titans and Supercarriers and thousands of Dreadnaughts and Carriers and smaller ships. 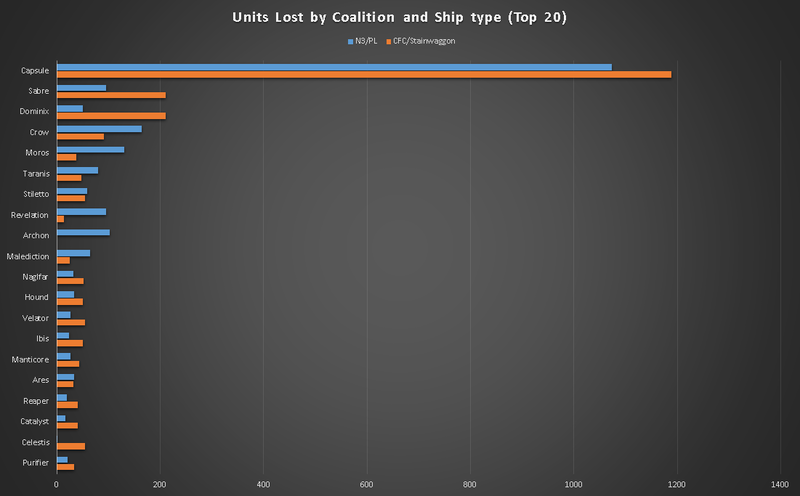 The battle was relatively even for some time with CFC and Russian forces holding moderate lead at first and only have a slight lead in Titan kills. Then came a turning point in the battle. Manfred Sideous, the initial Fleet Commander for PL/N3, handed over command to the CEO of Northern Coalition., Vince Draken. After successfully focusing fire to destroy several CFC/RUS Titans and causing some Russian Titans to jump out of the system with shields and armor depleted, PL/N3 began to overestimate their success and the primary target was switched to the Titan of Sort Dragon, one of fourteen members of the current Council of Stellar Management and the man coordinating all the Russian Forces left on field. His Titan successfully withstood the onslaught more than any so far with the assistance of his entire fleet actively working to repair it and very high damage resistance bonuses. By the time his structure was finally breached, the CFC/RUS forces had killed 5 Titans in return. From this point on, every volley cycle of the CFC/RUS Titan doomsdays put them further and further ahead. Here’s what it looked like—a particularly good video by a neutral third party witness. Here’s a shot with the in-game UI showing the action. Each red or orange dot is either a ship or a drone. Throughout the fight, related battles also raged across the universe. Fleets tried to prevent reinforcements, kill wounded capitals and super-capitals attempting to flee, or trap the brave few who were trying to enter the fight and tip the scales. The entire fight was watched live on Twitch.tv courtesy of Nick_Fuzzeh of Pandemic Legion as well as a host of other marathon streamers. In what can only be considered a meta-SciFi moment of more than 12,000 people watching a virtual war unfold live across the internet, his music news ticker, and……spooky dancing skeleton graphic entertained as the fight raged on. When the dust finally settled and daily server maintenance downtime ended the conflict, all involved were shocked at the devastation. The winning side alone had lost more Titans that in any battle seen before. The losing side had lost more Titans than anyone had previously thought possible. Almost immediately following the fight, players universally clamored for an in-game monument. Actually the emails amongst EVE developers demanding the same had already begun. Something of this scale, where the players had left an indelible mark on the universe through their extraordinary actions, needed to have something more permanent in game to commemorate it and we are proud to highlight the bravery and commitment of our players to their craft of blowing up spaceships. “Titanomachy” has been created using the brand new Titan wreck models that were introduced with EVE Online: Rubicon’s 1.1 release that was (coincidentally) deployed immediately following the battle itself. A permanent site in the game, it will be placed around the seventh planet in the B-R5RB solar system and be “off grid” from the station. Thereafter, any player who plays EVE can make the dangerous pilgrimage there and marvel at the scope of destruction. We expect some of the “travel” bloggers to do full write-ups on it almost immediately and EVE videographers to make some moving tributes as well. We’re aiming for installation of Titanomachy during downtime of January 31st, and are hard at work placing the wrecks in a hauntingly beautiful arrangement. You can read more about the process of creating the new Titan wrecks in this newly published devblog bythe EVE art team. A couple are pictured below. For more information about Rubicon check the feature site. For Rubicon 1.1, check out this in-development video, scan the past few dev blogs and read the patch notes. As always, new patches and expansions are free to all paid subscribers. 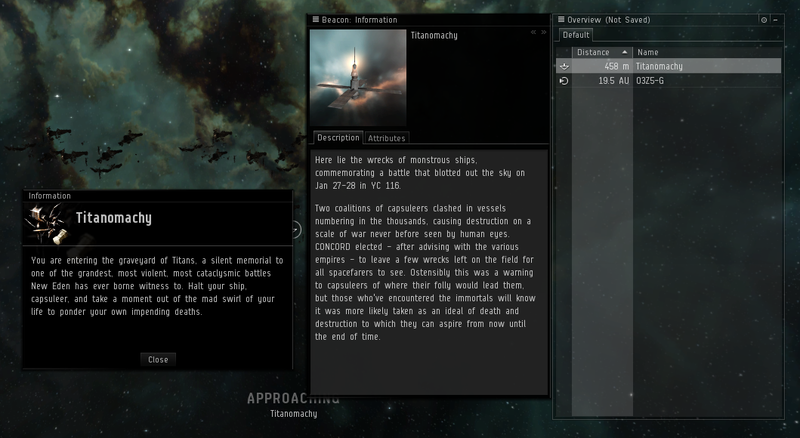 Note that these are filled with EVE Online-specific jargon and terms and can at times include colorful language. The light that they shed on the operations of these massive fleets by the people behind them is nonetheless fascinating. If a 21 hour, 2000+ player battle sounds like a lot of work for a server to handle, that’s because you have a good sense for how much load a 21 hour, 2000+ player battle is. Without some help, it would have been entirely too much to take and we wouldn’t be here talking about a bunch of exploded spaceships. In EVE, we know that fights like this are a major deciding factor in large-scale warfare, so in order to support them the best we can we introduced a system called Time Dilation. Its job is to give the server the means to control the amount of load an insane-scale fight like this causes. The mechanism behind Time Dilation is reasonably simple – if the server cannot keep up with the load of simulation, it slows down time in the solar systems it’s managing. For example, if there’s twice as much going on than the server can normally handle, it’s got the ability to run that heavy simulation at half speed, bring the rate of load back to something manageable. Due to how we set up our universe, the effect of this slowdown is localized, often applying to just the problematic system and allowing the vast majority of other online players to continue on as happy as can be blowing up ships, mining, trading, exploring etc as long as they didn’t come near these massive fights. With the length and intensity of this fight however, this slowdown was not enough to completely cover it, so it hit our limit of running the simulation at 10% of normal time. Consequently, over the 21 hours players experienced of the fight, the server was put to task to run just over 2 hours worth of simulation. It was much more able to fulfil that task than if it had to handle it all in real time, which ultimately gave players a smoother, more predictable experience than would take place otherwise. This wasn’t the largest single battle in terms of numbers of participants in system at once. That record still belongs to the battle for 6VDT-H, which reached 4,070 pilots in system. Who knows, you might find your home amongst the stars. You might find people around the globe you enjoy flying with and find worthy of slugging it out for 21 hours straight on behalf of. You might be the next person making that single mistake that causes thousands of people to hurtle their ships at you or you might be the person that catches that next mistake and becomes the hero of the day. Advice for new players: ask questions of vets and advice from them, don’t be afraid to look for answers on the internet, and try to find someone to fly with whether a friend from another game that starts at the same time, someone you know in real life, or one of the many corporations that recruit in game. It is a multiplayer game after all. EVE is a game that challenges you in a way that others just don’t, as I’m sure you gathered from this writeup. Be bold pilot.